The Astiazaran cider, who commercialised in USA under de denomination Barrika Basque has won the gold medal in the GLINTCAP (Great Lakes International Cider and Perry Competition) competition, the most important cider competition, which is celebrated yearly in USA. 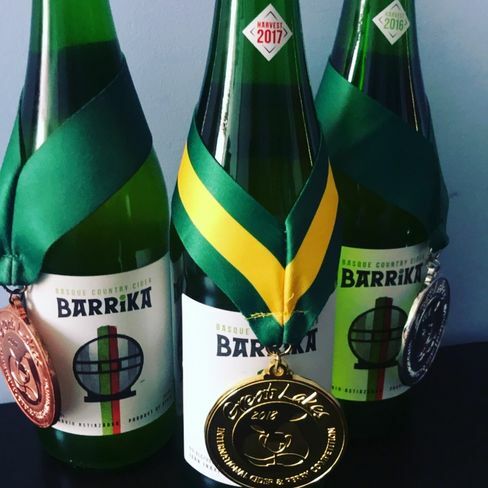 With the harvest of Astiazaran cider 2017 made in Zubieta, Barrika Basque has participated in the category of natural cider and has obtained the award “Second Best in Class” in the contest that this year celebrated its 13th edition and that has been organized in the city of Grand Rapids in Michigan. “Receiving this award of this category increase the recognition of our natural cider made in Gipuzkoa among the american cider maker community, every time they appreciate it more”, says David Cascione, the person in charge of Barrika Basque. With this new award Barrika Basque has accumulated 3 awards since on previous occasions it won silver medal (2016 harvest) and bronze medal (2015 harvest). The news of the award has been received at the Iruin cider house with great enthusiasm. This new recognition joins with more than 100 awards that the Astiazaran cider has received throughout its more than 120 years of history.